With a successful debut in 2014, Hades and Griffin returned in our 2015 show as ‘The Moon Dogs’. Griffin skilfully led the pony Longhope around the ring, who was being ridden by the bear. Obviously! Cartuchio and Dandi - In October 2014 Nell met with our head trainer Dany Cesar in Barcelona to search for some new horses for the upcoming show Moon Songs. Nell wanted to explore the possibility of finding some rare Cremello or Albino Andulscian horses. They have blue eyes and a luminous cream coat, perfect for a moon show. Working with Tarma from Spanish Horses UK, Nell found what she was looking for in Barcelona, in Cartuchio and Dandi. Jack made up the third white horse, a charismatic horse that enjoyed performing in the show and being centre of attention. Longhope - when this little bay gelding came to us, he had been a little overlooked in the yard where he was living. He turned out to be a well-bred show pony by a successful show pony stallion called Ainsty Musical Dream. Longhope was ridden by the bear and led by Griffin in Moon Songs. He proved to be very calm in the ring looked like a miniature racehorse. Jim - a Friesian Stallion whose full name is Tsijimke. People think that stallions are uncontrollable beasts but Jim, used to pull funeral carriages before he came to join us in April 2015, was calm and controlled. 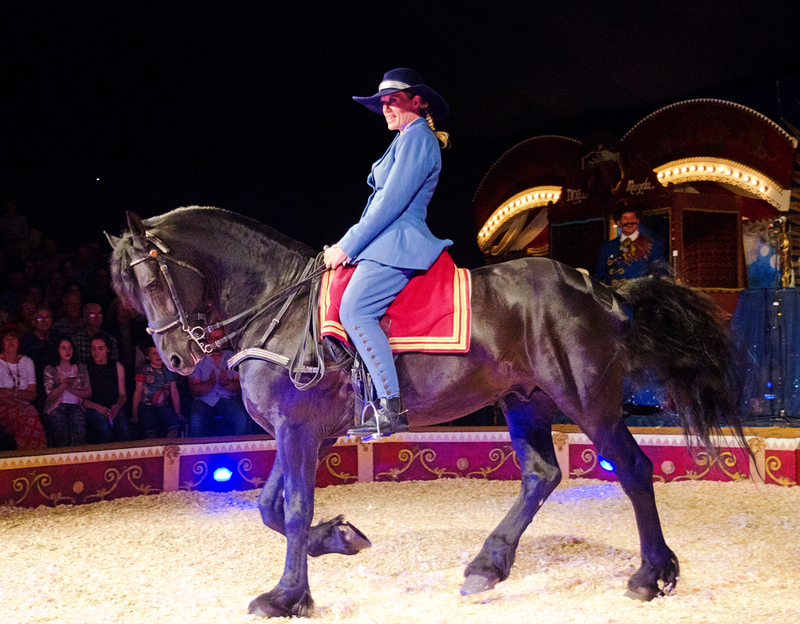 He settled in well and enjoyed his initial tour with the circus.